Nearly everyone has struggled in the wake of the Great Recession, but young Americans have suffered the most. While others have slowly returned to work, the unemployment rate for Americans ages 16–24 stands at 16.2 percent, more than double the national rate of unemployment. And even when this group eventually starts earning a paycheck, the impact of their unemployment will follow them for years. According to a new analysis by the Center for American Progress, young Americans will lose a staggering $20 billion in earnings over the next decade. Research shows that workers who are unemployed as young adults earn lower wages for many years following their period of unemployment due to forgone work experience and missed opportunities to develop skills. Building on this research, we estimate that the nearly 1 million young Americans who experienced long-term unemployment during the worst of the recession will lose more than $20 billion in earnings over the next 10 years. This equates to about $22,000 per person. The economic consequences of these lost wages to individuals and to the broader economy are serious. These young Americans—referred to as Millennials—will increasingly be forced to delay moving out of their parents’ homes, struggle to make payments on ballooning student-loan debt, and fail to save adequately for retirement. As a consequence of the prolonged unemployment of Millennials, the U.S. economy will feel the loss of aggregate demand in the form of slower growth and less job creation. To be sure, getting our economy back on track will require getting people of all ages back to work. But the problem of youth unemployment is especially pernicious, and as such it deserves special attention from lawmakers. In this issue brief we make the case that the United States has a serious youth-unemployment problem that will cost us dearly in the long run. We will show that the employment prospects for young Americans are dismal by both historical and international comparisons, and we will explore in detail the costs associated with our current levels of youth unemployment in terms of lost earnings, slower economic growth, and greater taxpayer burden. Just how bad is the U.S. job market for teens and young adults? Today’s young Americans face the worst employment prospects in recent history. 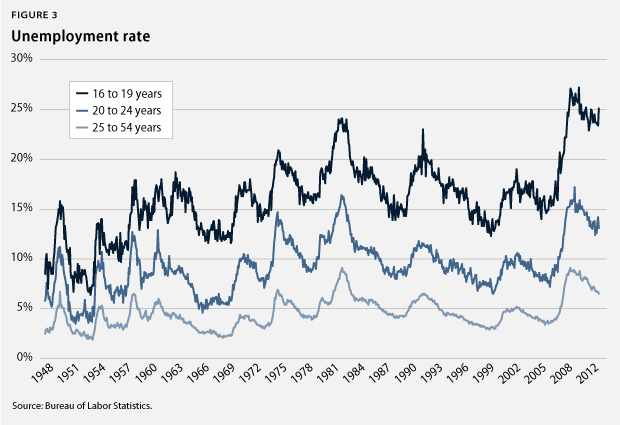 What’s more, trends in employment and unemployment rates since World War II indicate that the labor market is becoming even less friendly to young workers. Even prior to the Great Recession, young people had a hard time in the labor market, and their employment situation has worsened since. Over the past several decades, employment and labor-force participation among Americans ages 16–24 have declined, while the unemployment rate for this group has risen. During that same time period, these employment measures have remained stable or even improved for Americans in the prime working age group of 25–54, indicating that the youth-employment problem cannot be attributed solely to a worsening economy. And although declining employment and labor-force participation among young people can be pegged in part to rising educational attainment—more youth completing high school and postsecondary education—the data suggest that there is more to the story. Let’s look at three job-prospect measures for young Americans. 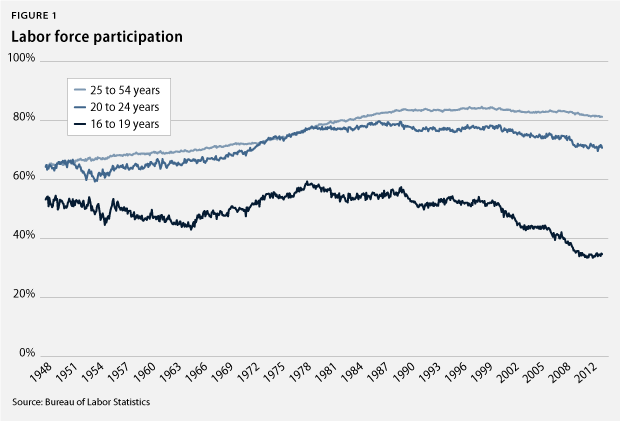 Labor-force participation: The labor-force participation rate is the percentage of individuals in the population who are either employed or unemployed and actively looking for work. This measure indicates the level of interest individuals have in working, although it can decline when workers become discouraged or pursue education—even if they would otherwise have the desire to work. While labor-force participation among young people increased in the years following World War II, it began to decline starting in the 1980s. The biggest drop in labor-force participation has been for teenagers, who saw their numbers decline from a high of nearly 60 percent in 1978 to an all-time low of 33.5 percent in 2012. Young adults ages 20–24 have fared somewhat better, but their labor-force participation rate has dropped from a high of 79.6 percent in 1987 to 70.1 percent today. Over the past three decades, labor-force participation among adults ages 25–54 has remained mostly stable at around 80 percent. To be sure, declining labor-force participation among teens and young adults is not necessarily a bad economic sign. Downward moves in labor-force participation can be attributed in part to increasing school enrollment, a positive development that boosts both workers’ earnings and broader economic growth. But today’s high unemployment rates indicate that there are too many young people who want to work but cannot find jobs. Employment-to-population ratio: The employment-to-population ratio is the proportion of individuals in the population who are employed. A high employment-to-population ratio indicates that people in the population are able to find jobs. 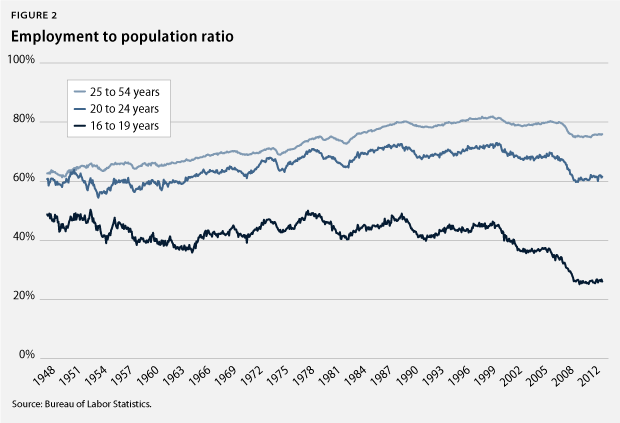 Since the 1980s the employment-to-population ratio for teenagers and young adults has declined, with the steepest drops occurring in the past decade. During that time employment among teenagers has dropped the most, falling from 50 percent in 1978 to just 25.8 percent today. Employment among young adults peaked at 72.9 percent in 2000, falling to 60.8 percent today. By contrast, employment among Americans of prime working age currently stands at 75.9 percent, about the same as it was in the mid-1980s. Here again, declining employment rates among young people are not necessarily bad if they represent increases in educational attainment. But because these changes are also accompanied by rising unemployment rates, they suggest that young people are dropping out of the labor market due to discouraging job prospects. Unemployment rate: The unemployment rate is the share of individuals in the labor force who are unemployed. To be considered unemployed, a worker must be looking for a job by sending out resumes, filling out applications, interviewing for positions, or engaging in other job-search activities. The unemployment rate indicates whether people are able to find employment, but it can also decline if workers become discouraged and quit looking for work—even if they want a job. Since World War II young people have become increasingly more likely to be unemployed, while the unemployment rate for adults has remained lower and relatively more stable. Today the unemployment rate among teens—although down slightly from an all-time high of 27.2 percent in 2010—is 24.2 percent, higher than it ever was prior to the Great Recession of 2007–2009. Young adults have fared somewhat better than teens, but they also experienced an all-time high unemployment rate in 2010, when 17.2 percent of people ages 20–24 were out of work. The trends in unemployment indicate that young job seekers have suffered disproportionately in the recession compared to adult workers. While advanced economies around the world are struggling with high unemployment in the wake of the global recession, the fact that some countries have been able to keep their youth unemployment rates relatively low indicates that high youth unemployment is not an inevitable consequence of an economic downturn. German, Danish, Dutch, and Austrian youth, for example, all enjoy lower unemployment rates than their American counterparts. While American youth are unemployed at a rate of 16.2 percent, youth in these countries are unemployed at rates of 7.9 percent, 15 percent, 10.3 percent, and 9.9 percent, respectively. What’s more, these countries have done a better job than the United States of keeping youth unemployment low relative to overall unemployment. The ratio of youth unemployment to overall unemployment is an indicator of how much more difficult it is for a young person to find a job compared to an adult worker. In the United States, the unemployment rate for workers ages 16–24 is more than twice the overall unemployment rate of 7.6 percent. In Germany, however, the unemployment rate for young workers—7.9 percent—is only 1.5 times the overall unemployment rate of 5.3 percent. Denmark, the Netherlands, and Austria also have ratios of youth unemployment to overall unemployment that are lower than that experienced in the United States. Certainly, more work must be done to understand why some countries seem to have labor markets that are more youth friendly, but some hypothesize it is because these countries tend to have workforce-development systems that support apprenticeships, vocational programs, and other worker-training programs that bolster the transition between school and work. Providing young people with more structured pathways into work could be the key to maintaining relatively low youth-unemployment levels even during periods of economic downturn. What we do know for sure from these examples is that America’s high level of youth unemployment is avoidable. The high unemployment rate for young Americans is a bad sign, but it doesn’t even begin to tell the whole story of just how grim employment prospects are for today’s young adults. Looking just at the overall unemployment rate obscures the extremely high rates of unemployment among communities of color, ignores workers who have given up on finding a job, and fails to take into account the many workers who are underemployed relative to their skills and education levels. 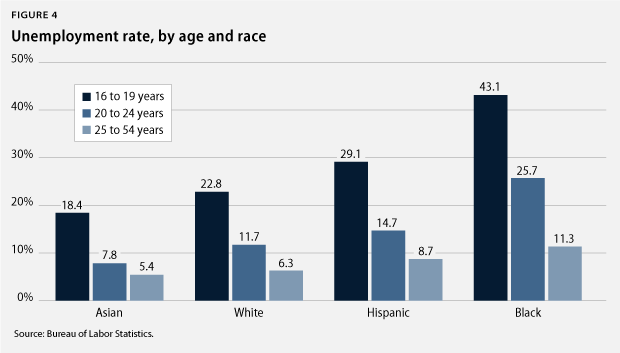 Unemployment is a major problem for young Americans in general, but it’s an even bigger problem for young people of color. While the overall unemployment rate for teenagers is 25.1 percent, the unemployment rate for black teens is 43.1 percent. And fully half of black males ages 16–19 are looking for work but unable to find a job. What’s more, the unemployment rate does not include discouraged workers—people who have looked for a job in the past year but who have grown discouraged and given up because they believe that there are no jobs available—or at least none for which they would qualify. The percentage of people aged 16–24 who are not in the labor force but who want a job is 11 percent, compared to 7.1 percent of people of all ages not in the labor force but who want a job. Furthermore, a study by the Center for Labor Market Studies estimated that in 2009 there were 2.8 million teens who wanted to work but who were not currently looking or were employed part time but wanted full-time work. This is in addition to the 1.5 million teens who were counted as unemployed, suggesting that the employment situation for young Americans may be even bleaker than the unemployment statistics convey. Moreover, unemployment numbers tell us nothing about the quality of jobs available to young workers, many of who find themselves overqualified and underpaid. In fact, about half of all recent college graduates are in jobs that do not require a four-year degree, and 37 percent are in jobs that require no more than a high school diploma. What is the true cost of youth unemployment? Not only is unemployment bad for young people now, but the negative effects of being unemployed have also been shown to follow a person throughout his or her career. A young person who has been unemployed for six months can expect to earn about $22,000 less over the next 10 years than they could have expected to earn had they not experienced a lengthy period of unemployment. In April 2010 the number of people ages 20–24 who were unemployed for more than six months had reached an all-time high of 967,000 people. We estimate that these young Americans will lose a total of $21.4 billion in earnings over the next 10 years. This estimate is based on a study that found men who experienced a six-month period of unemployment at age 22 earned 8 percent less at age 23 than they would have otherwise. The wage gap narrows with age, but it still persists. By age 26, the men earned 6 percent less than they would have if they had never been unemployed. Even by age 31, their wages were 3 percent or 4 percent lower than they otherwise would have been. Long-term unemployment robs young people of the opportunity to gain the skills, experiences, and connections that translate into higher wages. Related studies have found similar negative effects on future earnings. Researchers in the United Kingdom found that one year of youth unemployment at the age of 22 resulted in wages that were 13 percent to 21 percent less 20 years later. Another study that looked at American men who graduated from college during a recession estimated that an increase in the national unemployment rate of 1 percent translated into 6 percent to 7 percent lower wages initially and 2.5 percent lower wages 15 years down the road. The impact of these lost earnings on young Americans is readily apparent. Young Americans today find themselves being increasingly squeezed by everything from rising tuition costs to health care expenses to energy bills, but income for the typical household hasn’t increased in 20 years. The repercussions of this financial squeeze are clear. Today Americans under the age of 40 have accumulated less wealth than their parents did at that age more than 25 years ago. More than 13 percent of borrowers—mainly young adults—have defaulted on their student loans, and another 26 percent are delinquent. Young adults are now more likely to live with their parents and less likely to own a home than they were before the recession. And more than half of Americans ages 25–34 have saved less than $10,000 for retirement, increasing the odds that they will lack sufficient savings to retire in their old age. Yet another casualty of these lost wages is long-term U.S. economic growth. When workers earn less because they were once unemployed, they spend less money at supermarkets, bookstores, cafes, and other businesses. The effect of taking this spending out of the economy adds up, resulting in fewer jobs and slower economic growth. Allowing high levels of youth unemployment to persist will weaken America’s economic growth and prosperity for years to come. Moreover, youth unemployment creates an additional cost burden for taxpayers in the form of lost revenues, the need for government-provided health care, increased crime, and additional welfare payments. In a recent study commissioned by the White House Council on Community Solutions, researchers estimate that the fiscal cost of the 6.7 million Americans ages 16–24 who are neither working nor attending school is $1.6 trillion over their lifetimes. Failing to create jobs for unemployed young people today will leave taxpayers with a huge bill down the road. Ignoring the dire employment situation for young Americans is simply not an option. The economic consequences of high youth unemployment are enduring, and failing to employ young people today will result in lost earnings, greater costs, and slower economic growth tomorrow. Unfortunately, Congress is moving in the wrong direction with sequestration and misguided policy decisions to end programs that are proven to put young people to work. While youth unemployment has risen, Congress has cut $1 billion from youth jobs programs over the past decade. Furthermore, sequestration, with its across the board automatic spending cuts, will result in the elimination of 4,200 AmeriCorps positions, cutting back on an important source of jobs that allow young people to gain valuable experience and develop marketable skills. In future briefs, CAP will propose a series of forward-thinking policies that will help lawmakers tackle the nation’s youth-unemployment crisis. But Congress can start to address the crisis now by putting a stop to these shortsighted funding cuts and beginning to take youth unemployment seriously. Sarah Ayres is a Policy Analyst with the Economic Policy team at the Center for American Progress.